An hour ago, Wizards released their 7/13 Banned and Restricted Announcement to an eagerly awaiting Modern community. I’d been refreshing pages for about two hours by that point, so I hope you join me in taking our collective hats off to Wizards as we applaud them for the Announcement’s decision: no changes. I’m not just happy about this because it fit my banlist prediction article from last Wednesday, although it’s great to see that our banlist analysis is on the right track. The real reason to be excited is that this announcement shows Wizards is able to rise above ban-mania, analyze the format objectively, consider the datapoints for what they are, and reach a fair decision in the face of a divided community. In light (calm, peaceful light!) of today’s announcement, I want to touch on a few points related to this recent decision and how it should affect our format analysis going ahead. This includes a recap of why nothing needed to be banned, a reemphasis of why nothing needed to be unbanned, and a reaffirmation of why this decision is so important for Modern’s future. I’m going to focus on the banning piece because that was by far the biggest factor leading up to the 7/13 announcement. June might have been one of my favorite months for Modern coverage and gameplay, but it was one of the worst for banlist discussion. It felt like every other Modern article on most sites, and most commentary by top players, was unusually ban-centric. There was talk about banning Summer Bloom, Goryo’s Vengeance, Simian Spirit Guide, Splinter Twin, Snapcaster Mage, and what felt like every card from a top-tier deck (and almost literally every card from a top-tier combo deck). GP Charlotte was a low-point in this discussion, with SCG commentators loudly asking players about what they wanted banned from Amulet Bloom, or even what Modern banlist changes they expected for the format. The core failure behind this discussion was a fundamental misunderstanding of both Wizards’ ban policy as a whole, and specific elements of that ban policy like the turn four rule. To be clear, I definitely don’t claim special inside knowledge of either of those things. But I do try and base my own banlist predictions around both the broader Modern metagame context, and the historical context and examples of previous ban decisions. Both of these were conspicuously absent from most banlist discussion. This is why a lot of commentators and community members were so far off-base in their calling for Bloom, Vengeance, Shoal, Twin, and other bans: they just weren’t situating their ban-mania in the broader Modern context. Instead of discussing those different contexts on their own, I want to focus on them with respect to three different decks. These decks exemplify different Modern banlist considerations that, when misunderstood, can lead players to making inaccurate assessments of format health and card bannability. In analyzing these three case studies, hopefully we can all make more accurate and less alarmist ban assessments in the future. I’ll be the first to admit that I was worried about Amulet Bloom back in May and early June. We had a ton of results, including some scary win-percentage statistics from MTGO, suggesting this really was the best deck in the format. Although Amulet Bloom players were defending their deck, these weren’t exactly the most objective judges of Bloom’s health in the format. By most quantitative and qualitative metrics, Amulet Bloom looked like it was going to be a monster during the June GP circuit. And then came the Blood Moon over GP Charlotte. As I wrote in my GP Charlotte retrospective, GP Charlotte (and the rest of the GPs throughout the month) showed the world that Modern is capable of some degree of self-regulation. Between tech like Moon, an increased reliance on catchalls like Cursecatcher and Spell Snare, and just improved deck/matchup knowledge, Modern players are able to police their own format. Before GP Charlotte, there was always some chance that Amulet Bloom was the format’s best deck, or that its relative novelty just made it an unexpected deck people weren’t ready for. Once the GP rolled around, it became clear it was the latter case: this deck was eminently policeable if people were prepared. This was reflected in the deck’s metagame shares, which never crept over 5% in MTGO and was well under 4% in paper. When past combo decks got banned, such as Storm, their metagame shares were much larger and were sustained for longer periods of time. The 7/13 announcement strongly suggests Wizards views Amulet the same way and prefers internal self-policing to external bans. No sooner had the Amulet Bloom ban-mania died down than the Griselbrand and Nourishing Shoal ban-mania take its place. Following Zach Jesse’s Top 8 finish with the deck at Charlotte, the combo deck exploded onto the radar of every ban-minded Modern player. It was billed as the most broken deck in the format with strong matchups across the board, a challenging axis of interaction, and extremely frequent turn two and three wins. All of this appeared to make it an ideal candidate for banning under Wizards’ oft-misunderstood turn four rule. But there was just one problem: people had forgotten the most important part of the turn four rule, which is the “top-tier” status of the deck in question. Amulet Bloom had threatened to reach tier 1 a few times before June, but Grishoalbrand was never even close. By the end of June, the deck was still under 2% of the collective metagame, seeing the most play at GP Day 2s where it comprised only 2.8% of the field. The deck also completely flubbed out of the Modern Festival, sending no one to the Top 32 and making up just over 2% of the Preliminaries. So when the ban announcement rolled around on 7/13, no one should have been surprised that nothing from Grishoalbrand was on the chopping block: the deck was never even close to top-tier status for its limited time in Modern. Will this deck eventually get there? We need to wait and see. But the point, and the lesson learned, is that the deck was not top-tier during June and thus should never have been under consideration for a banning. When there’s nothing else to talk about in Modern, I can always count on ban discussion shifting to Splinter Twin, Deceiver Exarch, and/or Snapcaster Mage. To some extent, it’s fair to voice concerns about what is probably Modern’s “best” tier 1 deck, or at least its most consistent. Birthing Pod is still fresh on our minds and Twin has some (but not all) the trappings of the Pod scenario we faced back in January 2015. But it is in the Pod example itself that the comparison, and by extension the Twin ban-talk, breaks down. When decks get banned for reducing format diversity or being too dominant, this is exclusively a metagame share argument. Pod’s metagame share had been at 10%-12% for a while, and although they crashed down to sub-5% for the first part of the Treasure Cruise era, they catapulted up to 15%-20% on the back of Siege Rhino and other metagame contexts. This was on top of an excessive number of GP wins and Top 8/16 appearances. Twin isn’t even close to that degree of prevalence. Even combining all the Twin decks into one collective group (which I’m not even convinced we can do fairly), we still see a deck that is less than 13% of the metagame. We also see a lot of differences between those Twin decks, and pretty wide variation in their performance (e.g. Twin decks aren’t even winning every event). All of this suggests it’s okay to have strong tier 1 decks in the format, or even a most-played deck. It’s just not okay if that deck reaches Pod, Delver, or Deathrite Shaman-era Jund levels. So long as Twin stays in its current metagame prevalence band, it will remain safe. In all these assessments, the key ban factors are a) metagame prevalence and b) ban decision history. Whenever we forget both of those elements, it’s incredibly easy to misevaluate the format’s health and the safety of cards that might appear dangerous. But if we use these three examples to inform our future predictions, not to mention this banlist announcement itself, we will be much more likely to make accurate assessments and stay away from ban-mania. Metagame breakdowns, like my 6/1 – 7/1 discussion from last week, are helpful in this regard. So is an in-depth understanding of banlist dynamics, as in my analysis of the turn four rule from the most recent banlist prediction. In fairness to the Modern community, many players won’t be upset at this banlist announcement because nothing was banned. They will just be disappointed that nothing was unbanned. Common suggestions in this category include Sword of the Meek (reasonable! ), Ancestral Vision (risky…), Bloodbraid Elf (insane, given Jund’s current prevalence), and Stoneforge Mystic (people who didn’t play Magic in 2011). As with the banning suggestions, the problem with the unbanning camps is one of context. When considering an unban, Wizards likely weighs two overlapping (and occasionally competing) criterion. First is the criterion most people acknowledge: the individual power level of the card. Something like Sword isn’t necessarily a fair card, but it also doesn’t feel nearly as broken as things already happening in Modern. For instance, it’s a stretch to think Sword of the Meek and Thopter Foundry would be significantly better than the existing Twin combos (especially with all the Kolaghan’s Command running around). But this consideration is at odds with the second consideration, which is the one most people forget: metagame context. As Wizards has shown time and time again, unbans are unlikely in diverse and stable formats. Although the 2012 Valakut unbanning is a bit of an exception to this, (“Recent Modern tournaments have been diverse, with no deck dominating the metagame… The DCI is unbanning a card to see how that affects the format.”), this is mostly how Wizards has treated the rest of their unbans (Nacatl, Bitterblossom, Troll). Moreover, the metagame in which Valakut was unbanned was very different from our current one. We are going through a period of big changes, with Grixis Control recently rising to prominence as a legitimate top-tier control deck, cards like Collected Company still looking to find their optimal home, and a big new set just released with possible Modern implications (Day’s Undoing is big here). With no deck at more than 10% of the metagame, there’s just no good reason to unban a card right now. The metagame has enough diversity and options without adding anything else. Could Ancestral Vision benefit control decks? Maybe, but maybe those decks don’t need help. Maybe Grixis Control is able to rise to the top without any help from Vision. Indeed, maybe Vision throws the balanced format out of alignment when there’s no reason to take that risk. We are likely to see unbans in either stagnant metagames with no deck movement, or in metagames recently gutted by bans. This most recent announcement confirms our thinking on this matter, and will serve as a useful datapoint in future predictions. The real winners here are not Amulet Bloom or Grishoalbrand players (and certainly not the clowns who bought out all the foil Sword of the Meeks over the weekend). The real winners are the women and men of the Modern community who rely on Wizards for fair, objective, and consistent management of their format. If nothing else, this ban announcement signals that we are all on the same page with assessing Modern’s health. I talked about this in my banlist prediction article, and it’s important to restate here after the 7/13 announcement is in the books. If Wizards had banned something today, or even unbanned something, it would signal that our understanding of the format is radically different from Wizards’. But because they did nothing, it suggests many of us are in agreement about what makes a stable format, what makes a healthy deck, and what Wizards’ responsibility is in such a situation. This should give us great confidence going forward: Wizards has proven they can remain reasonable and objective despite lots of commentary to the contrary. This is great news for players who are worried about investing in Modern for fear of bans, and worried about playing Modern for fear of instability. I’ll be on vacation this week, so expect some significantly shorter articles on Tuesday and Wednesday before Trevor and Jordan release their longer pieces at the end of the week. How do you all feel about the banlist update? Anything you would have done differently if you were part of Wizards? How do you think this informs ban decisions going ahead? Looking forward to hearing from you in the comments and to continuing to play in our format where no banlist changes are needed. I think you nailed it man, the ban list doesn’t need to be altered in any way right now. If Grizshoalbrand takes off like crazy over the next few months wizards may look into it, but for now your reasonings and predictions were spot on. I think there is plenty out there in the way of hate for it (even if on the draw) so I don’t see much happening with it. Have fun on your vacation, we all look forward to reading your work when you return. 1) Ban the hole deck banning Griselbrand or Goryo’s Vengeance. 2) Unbanning DRS or printing “DRS lite” in the next block. Given that Jund is currently 10% of the format and the format’s most-played tier 1 deck, anything involving a DRS unban seems really problematic. Why can’t we just let the format self-police? There’s no current reason to believe the deck needs a ban. And if it does become a problem, cards like Scooze are much better (safer) answers than monsters like DRS. I find it a bit odd that you can on one hand say “Why can’t we just let the format self-police?” and on the other hand not be on board with unbannings. Some things are clearly broken (Blazing Shoal, Treasure Cruise) or cause logistical nightmares (Sensei’s Diving Top – that card needs to say, once per turn and/or sorcery speed and then we can have something like that in Modern). But others are just powerful (Seething Song and Deathrite Shaman come to mind) – why can’t Modern be allowed to police those cards? I’m not here to advocate a mass unbanning – but I’m just against your argument because a lot of the cards we want unbanned are merely powerful (but not broken) effects or were banned for creating ‘homogeneity’ – only to be replaced by other homogenous cards (Serum Visions, Tarmogoyf etc). If you subscribe to Wizards’ fundamental format rules, then these cards have to stay banned. DRS broke the format: I saw the metagame data and it was awful from tournament to tournament. No one enjoyed a format that was 20% BGx varieties with DRS (and that’s not even counting Melira Pod with DRS). Why would you risk opening that up again just to “prove” a card is broken? We already have the datapoint that suggests it’s broken. There are a dozen reasons Wizards needs to be conservative with unbannings, including format stability, player retention, price management, consistency as a managing entity, etc. It’s fine for Wizards to revisit old bans/unbans and check them against the current environment, but this needs to be done methodically. It also needs to be a cost/benefit analysis for format health. Take Song, for example. Maybe an unbanned Song just brings Storm up to a 5% metagame share and is kept in check by other decks. Or maybe Song sees Storm rise to 11% again, re-violating the rules under which it was first banned. Why risk that? That decision does not inspire long-term confidence in the format: it just suggests Wizards is catering to the masses at the expense of format stability. Self police? Lightning bolt your deathrite. Well, we tried that already. It apparently didn’t work, because both DRS and Bolt were legal at the same time and DRS was still a trainwreck for the format and its diversity. Just out of curiosity, why go right for the throat on the deck and ban either of the two best cards in it? If you ban Nourishing Shoal then the deck is still very playable, but not necessarily a problem. Additionally, pet decks that use Griselbrand can still function for FNM fun. I don’t play the deck myself so I can’t speak to how much Wizards would cut off if they chose to ban the Shoal–but I imagine it’ be considerably less than banning the Goyro’s or Gris. Just seems a little silly to ban a spell that gains X life and nothing else. Griselbrand, being a Yawg’s bargain on a stick and all, is just asking to be abused, and him being around might restrict design space for reanimation spells in the future. He is clearly the broken piece of that deck, not Goryo’s or Shoal. The deck will be dead of any of those 3 are banned (it was not competitive before playing shoal anyway) so there’s no real reason to ban an innocent card like Shoal in the hopes that it will not kill the deck. The idea that Control shouldn’t get unbans because Grixis “Control” exists is inherrently flawed. Even if Grixis stays tier 1, even if it becomes the best deck in the format, Control as a whole will still have a less than 20% meta share (which clearly means that it is underepresented) unless if Grixis gets to 14+% of the meta, which would make a ban a possibility. No matter how good Grixis gets, Control will still be underrepresented unless if Grixis reaches bannable levels. Unbanning Sword of the Meek would change that by helping to boost a non-Grixis Control deck so that Control can get equal representation without Grixis having to reach bannable levels. I also can’t think of a single good argument against it getting unbanned. I just don’t see why not to unban it. Modern has nothing to lose and everything to gain. Ummm Burn decks get completely pushed out? Also you do realize grixis could just as well run thopter sword combo right? Every single card that is unbanned to make control good, stands to make grixis better. Explain how Thopter Sword is great against Burn. At best, if the combo is assembled on turn 3, it only gets 1 activation before turn 4. Burn can easily kill through that on turn 4 when on the play, especially since if the Control player wasn’t interacting with them at all on turns 2 and 3. And assembling the combo that early is highly unlikely, especially since you don’t want redundancy since both pieces do completely nothing without the other. 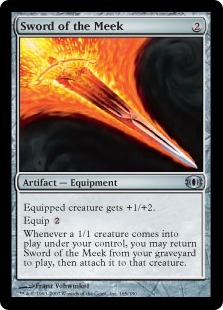 This means that Thopter/Sword will usually be a late-game win-con, which isn’t much worse for Burn to fight through than something like a Wurmcoil Engine would be. And why would Grixis run the Thopter/Sword Combo. How does it help them? What would they cut? They have no synergy with it and it is relatively slow, which makes it bad against Combo. Since the pieces do nothing on their own they are terrible to draw without each other and they are usually too slow to stop turn 4 kills from Aggro decks. It honestly seems like it would just make it a little better against Midrange, and a small increase in already favorable matchups is not worth 6-8 slots. Modern has nothing to lose? How about the healthiest metagame in the history of the format? I don’t why people think blue control needs to have a higher share of the meta than it does now. Modern doesn’t really need more than one good blue control deck. You can always play Tron too, playing control doesn’t have to mean playing draw-go for 15 turns and then winning with celestial colonnade. If a card doesn’t need to be banned, it should be unbanned. This should be true no matter how healthy the format is. Also, I am not asking for specifically blue control decks. I’d love more blue control, but I’d also be fine with decks like Monoblack Control, White Red Prison, Land Destruction, Skred Red, or even just some control decks that are bigger versions of Jund and Junk. But RG Tron is not a Control deck. It doesn’t want to interact. It plays board-wipes out of sheer necessity. It is trying to ignore you as much as possible. That is not how Control works, and until Control is equally represented with the other archetypes, the format will be imbalanced. I think he meant U-tron? The key here is not that Grixis Control “shouldn’t” get unbans. The key is that while a control deck is currently in flux, there is no good reason to unban another control card. It’s much safer to just wait. It’s also better from a PR perspective, because you can just unban the card when the format needs more help and the unban will drum up more popularity. Given that the deck has only been around in any serious capacity for a month, there’s just no reason to initiate unbans right now. Wizards is much likelier to wait until the format looks different. My point is this. It doesn’t matter that Grixis “Control” (I’ll agree that it is Control for this conversation) is in flux. No matter how good Grixis Control gets, unless if it gets to a bannable meta share, the overall amount of Control in the meta is still going to be below 20%, which makes it highly underrepresented. I agree that Sword probably won’t be unbanned at least until the PT (they never haave unbanned anything except for right before the PT), but it still deserves to be unbanned as soon as possible and the format would either benefit a lot from it or not be affected at all. The point is, you don’t want to just randomly unban cards in a metagame that is already undergoing change. There’s no such thing as an inherently safe card: all cards are only safe in the context of the metagame. BBE seemed like a great unban back in February when Abzan was at 18%+ and Jund was practically nonexistent. But now it would be a ridiculous unban that would only serve to increase the metagame share of the current most-played deck. To prove that a card like BBE is safe, you would need to wait a few ban cycles to see how Jund did throughout that time. The same goes for Control cards like AV and Sword. Maybe Grixis Control leaps to 20% of the metagame. Maybe it stays at 5%. We just don’t know right now because the metagame is in the process of evolving, so there’s no good reason to tamper with that until it’s clear that the metagame’s rate of change has slowed. Also, from a purely PR perspective, Wizards wants to reserve some unbans specifically for those slower periods of Modern growth. Maybe Control stagnates for a while and starts to backslide, while aggro is on the rise: that’s a great time to unban something like Sword. But you aren’t going to just release all the unbannable cards at once, because if any one of them is a problem, you can’t figure out which one it is or why that card failed to do what it was supposed to (or did it too well). I just can’t stand that Seething Song is banned because of a somewhat consistent turn 3 kill and amulet/bloom and Gorgyos/Griselbrand aren’t. Was storm a top tier? Yes, but we have to remember that it was because it was super cheap! Storn wasn’t winning any event, GP top8s that is all. I don’t see how grishoalbrand and amulet bloom are not breaking this turn 4 rule, they are not tier1 decks? Maybe, but i don’t see how that matters. For me not banning these cards is a hypocrite attitude from WOTC, that could be explained if modern bannings only matter to them before the modern PT. I do wonder how many players just avoid those decks because they expect them to be banned. And similarly, even though they passed this test are people sure they’ll never be banned? All it would take is a bunch of players jumping in and doing well over the next few months and by BFZ we may be calling either or both “top tier” leading to some pieces of the decks getting banned. I can respect wizards taking more time to see what happens – but I am not sure these decks are good for the health of the format. Having to play blood moon and leyline of the void in every deck just to not lose to these decks doesn’t sound healthy to me (if that’s what “self policing” means). It doesn’t matter why a deck was top-tier. It just matters, to Wizards at least, THAT a deck was top-tier. Storm had a huge metagame percentage at the time and Grishoalbrand does not. So long as a deck continues to not have that high metagame share, it doesn’t trigger violations of the turn four rule. The best reason for this is sample size. If a deck is routinely winning on turn two/three when it’s only 2% of the metagame, who knows why that is. Maybe the deck is broken. Maybe people just don’t know how to beat it, aren’t playing cards against it, or the deck is just getting lucky with matchups. Only when a deck reaches top-tier status can you really know if the turn three or less win rate is real or just within expected variance. If the June GP’s showed us anything about Bloom, it’s that it can be hated down. The deck was “the boogeyman” going into Charlotte and the SCG Invitational, so players adjusted accordingly. This is a nod of respect to the power of the deck, though a little distressing since one deck managed to warp a couple cards in the sideboards and mainboards across many archetypes. 1) A slight increase in Bloom players who were too afraid to buy-in in case there was a ban. 2) An increase in the skill of Bloom players who have taken the time to master the deck. As for Grishoalbrand – I don’t think it’s been a known entity long enough to achieve any kind of top tier presence, at least according to your standards. This particular variation of Goryo’s reanimator seemingly burst onto the scene at Charlotte. I think one of the reasons the Cruise-fueled Delver rapidly grew in popularity was because anyone playing a U/R-based deck had at least half the cards, whereas the Kamigawa-block staples of Grishoalbrand aren’t exactly common and rapidly inflated in price (read: the more pieces needed to assemble the deck probably translates to slower incorporation into the format). What this all means in the long term is anybody’s guess. Like Wizards we will sit back, check the data, and complain when we’re killed before T4! I agree WotC made the right call here. The format feels pretty healthy, and as you mentioned is actually still undergoing interesting changes, with more fun on the horizon. With that said, I’m always a little sad when a banlist update goes by with no changes of any kind just because shake ups are fun in the short term even if they are ultimately a bad idea :). Also general question/comment – what happened to esper mentor? It was being touted on this site a while back in the same breath as grixis delver. Grixis delver has given way to grixis control – but where’s our beloved mentor in all of this? Is esper dead again after all? We had some early pre-trends suggesting the deck was good, but they never materialized. A huge reason for this was the hype around Kolaghan’s Command, an awesome card that Esper can’t run. This shifted players away from Esper and into Grixis colors, where you also got access to Bolt when Esper was stuck with Disfigure and Path. In a fairer metagame with bigger creatures, Esper becomes a lot better for the same reasons Abzan becomes better (Souls, Path, etc.). But this current metagame isn’t as hospitable to it, so it’s just not doing much right now. That’s a reasonable and interesting comparison. Esper mentor is to grixis control what abzan midrange is to jund. When lingering souls and path are better than bolt and kolagan’s the white options will be more interesting. It’d be nice if those people would stop and read an article like this before complaining about lack of bannings. I strongly encourage everyone to spread the word about this article and the banlist philosophy in it. Although I am not a big fan of shameless self-promotion, the doomsaying and misevaluations around the banlist are incredibly unhealthy for this format and need to stop. They reflect a fundamental misunderstanding of most of the banlist criteria and also the metagame itself. People who compare Seething Song Storm and Grishoalbrand either have no idea about the history of Storm and the reasons for its banning, or have no idea about Grishoalbrand’s current metagame representation. So spread the word far and wide! “Bloom had success at a number of large profile events winning on turns 2 and 3. All this author is doing is speculating on things we can’t actually know about. That is why I don’t bother discussing or speculating on these changes any more. Wizards is going to do whatever they want regardless of what actual data says. I expect we’ll see something from him on the meadery, since he’s been very vocal about modern in the past. He has analyzed data as well, though he only covered, at most, top 64 in several events for a total of 230ish data points for “high level” performers. He thusly complained about the cruise and pod ban here: http://themeadery.org/articles/ban-list-blues/ . I expect to see something similar from him before too long. I read that article, and it felt very subjective and like an absolute whinefest. He makes casual allusions to numbers without explaining his methodology in detail (thus failing to make the article stand-alone content) and his latter paragraphs reek of personal bias. I don’t really consider that type of analysis to be on the same caliber as the stuff that the folks here have striven to give us, so I wouldn’t treat it with the same deference. Bloom Titan and Grishoalbrand ARE completely busted, lets not pretend they arent. However, both these decks have cards completely unique to their own decklist . Therefore, i dont think many people are buying into them due to fear of bannings or simply lack of the cards in their collection… probably both. I’d love to build Grishoal brand, but i only own 20% of the list and would need to sink in a decent amount to get it going, which would lead toward the issue of it getting banned. Someone else was right, Storm with Seething Song was popular because it was good and cheap, but Bloom and Grish arent exactly cheap with cards that you can transfer to a similar, different, deck if something like Goryo’s gets banned hammered.